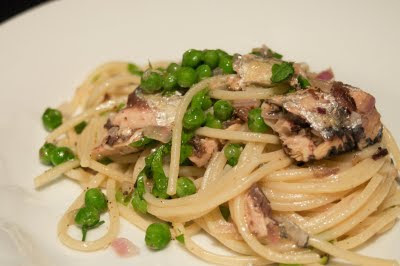 I didn't feel like heading out to the store, so made a quick simple dinner at home: thinly sliced fennel with lemon and olive and one of my favorite at home comfort foods: pasta with sardines. 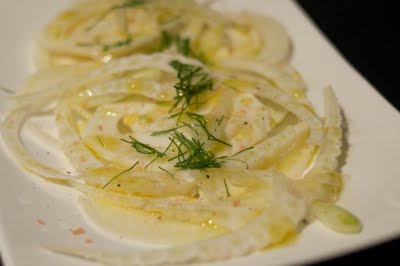 The fennel salad is very easy: just shave / thinly slice the fennel and lay the pieces spread out on a plate, add salt (I used Hawaiian Red Alae Sea Salt), pepper, fresh squeezed lemon juice, peppery olive oil, and a few of the fennel fronds as garnish. Fresh, clean, anisey, so simple and such a wonderful palate awakener. I have posted variations on the next course a couple of times, basically for three simple reasons. 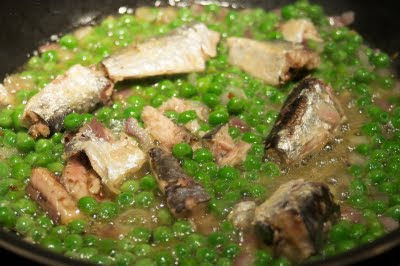 It's really easy to make, I just love sardines, and I always have the ingredients at home. Get a large pot of salted water boiling and add the pasta to the pot. When the pasta is a few minutes from being done, add olive oil and the finely chopped onion to a saute pan on medium high heat. Season with salt and pepper. After about a minute, add the red pepper flakes (to taste, but about a teaspoon works well for a nice background heat) and the peas. After another minute, add the can of sardines with the oil from the can (there is great flavor in that oil) and heat through the sardines. Add a squeeze of lemon and lemon zest to the pan. When the pasta is ready add the pasta to the pot and add pasta water as necessary. 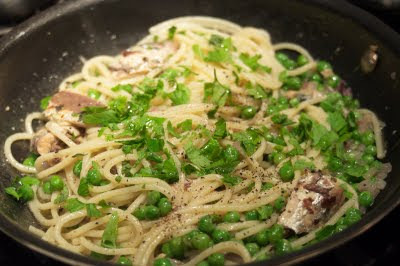 Turn off the heat, add the fresh parsley, and toss through the pasta. Serve with a light crisp white wine such as Muscadet (Pepiere, Luneau-Papin, Landron, Bregeon), Firriato 2007 Altavilla della Corte Grillo, or Clos Roche Blanche 2008 Sauvignon No. 2.